The older we get, the more serious we get about making financial plans for the future – investments, wills, trusts, retirement, death etc. We hear experts say, “Make sure you have a plan!” We all know it’s smart to have a plan for every potential scenario. One thing we often forget or put off is to make sure we share these plans with our children. 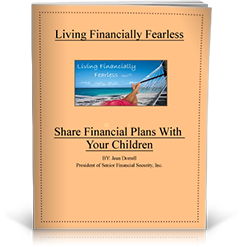 Living Financially Fearless is a series of e-books written by Jean Ann Dorrell. Each edition consists of important facts and tips that should help reduce financial stress. Each e-book provides useful tools that will bring you closer to living financially fearless! Please fill in the fields below to download your copy of ‘Living Financially Fearless: Share Financial Plans With Your Children’.